The forestry sector alone cannot achieve sustainable forest management. Other sectors' policies, especially that of agriculture and livestock management, energy, water and tourism, may directly or indirectly influence the way forest resources are managed. They may sometimes even foster deforestation and forest degradation. On the other hand, the goods and services from trees and forests also benefit other sectors and forestry plays an important role in rural development and the livelihoods of the poor. Global trends such as increased demand for energy and raw materials, globalization, trade liberalization and the diversification of demand for forest goods and services, have enhanced this reciprocity. To achieve sustainable forest management, the forestry sector therefore needs to engage with other sectors so as to better coordinate and harmonize policies, especially in areas of conflicting priorities. 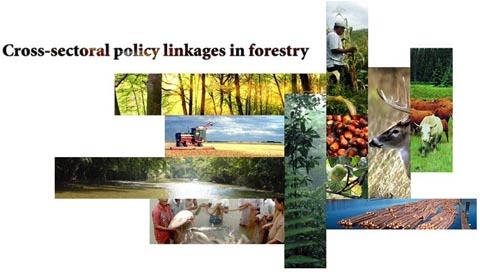 The non-legally binding instrument on all types of forests adopted at the Seventh Session of the United Nations Forum on Forests in April 2007 encourages member states to identify and implement measures to enhance cooperation and coordination of policies and programmes among sectors affecting and affected by forest policies and management. It thus aims to integrate the forestry sector into national decision-making processes and promote sustainable forest management by addressing the underlying causes of deforestation and forest degradation, and by promoting forest conservation, among others. The FAO Forestry Department is promoting dialogue between forestry and other related sectors in member states in order to foster policy coordination at the national level. It also promotes exchange of experiences at the regional level through workshops and other technical meetings. In addition, the FAO Forestry Department, in collaboration with other departments at FAO, addresses the forestry-agriculture interface that gives rise to many land use conflicts.